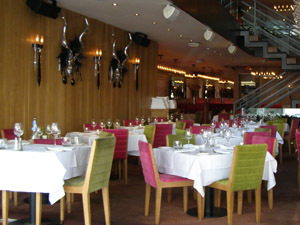 Cavalli Ristorante & Bar, located on bustling Peel Street in Montréal, Canada has a sleek and contemporary ambience and a culinary blend of Italian, Mediterranean, and Fusion cuisine where the presentations are as attractive as the restaurant. 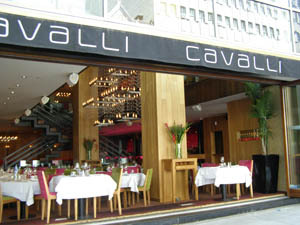 It was lunchtime at Cavalli Ristorante & Bar, the day was warm and sunny, the retractable glass at the front of the restaurant was open with beckoning palm trees in black pots, and was bustling with traffic from the nearby businesses. The ambience at the restaurant is contemporary and comfortable with pink and green velvet chairs and banquettes, square tables are doubled draped with white linens and white napkins, framed mirrors add dimension to the open space, hanging yellow crystal fixtures studded with light bulbs add a touch of drama, wood paneling in the front of the restaurant feature sconces that accentuate the artistic silver animal horns dressed with black feathers gracing the walls, large vases placed throughout the restaurant hold exotic floral arrangements of Birds of Paradise, a long bar lines one wall of the restaurant, and a wrought iron and wood open staircase leading to the second floor adds a focal point to the room. Service is attentive by female waitstaff attired in lipstick red mini-cocktail dresses with matching lipstick red stiletto heels, while male waitstaff wear red and white striped shirts and dark pants. Edward F. Nesta and I had lunch at Cavalli Ristorante & Bar in May 2009 where we began with an appetizer of Caprese Salad (Salade Caprese, tomates heirloom, mozzarella de bufala, olives et basilica). The salad was attractively presented on a white rectangular plate with generous slices of deliciously ripe yellow and red heirloom tomatoes, sliced yellow cherry tomatoes, fresh mozzarella de bufala, and niçoise olives, with basil and mint, and drizzled with balsamic and olive oil, accompanied by a wooden box lined with a white napkin and filled with an assortment of breads. 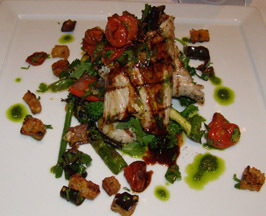 For his second course, Edward continued with the Paillard of Grilled Veal (Paillard de veau grillée au mozzarella de bufala et roquette avec artichauts, panzanella et salsa verde) that was another well-presented and tasty course, featuring very tender grilled veal stuffed with mozzarella de bufala, garnished with rocket and artichokes, panzanella, and a drizzle of salsa verde. Paired with a 2007 La Crema Pinot Noir from the Sonoma Coast of California, 13.9% alcohol that our server had decanted prior to pouring, it was a delightful way to say "bienvenue" (welcome) to Montréal. 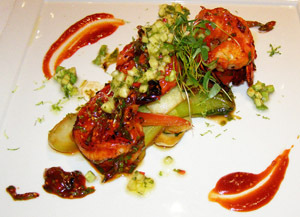 I had the Grilled Shrimp (Crevettes grilles dans une marinade à l‘asiatique avec salsa d'ananas, de coriandre, et d'avocat) presented on a large square white plate with jumbo shrimp that were kissed with a harmonious Asiatic marinade of pineapple sauce, garnished with coriander and tiny, diced avocado, with a brush of sauce painted on the plate. The flavors really worked together in this dish and had just the right level of spiciness to add interest and sweetness to round out the flavors. Although the desserts looked wonderful, we decided not to indulge as we were more than satisfied with the ample portions of our two-course lunch, and besides, Montréal, Canada's second largest city was waiting for us to discover all it has offer! Cavalli Ristorante & Bar is open daily for lunch from 12:00 pm - 3:00 pm, and for dinner from 5:00 pm - 11:00 pm. Read other articles on Montréal in the Destinations, Hotels and Resorts, Restaurants, and Chefs' Recipes sections. For more information on Montréal and Quebec, please visit the websites: www.QuebecRegion.com, www.BonjourQuebec.com, and www.Tourism-Montreal.org. © September 2009. Luxury Experience. www.LuxuryExperience.com All rights reserved.